Hey all! It’s Jess from East Coast Creative and I don’t know about you, but I’m itching to Fall-ify my home. Monica’s been busy putting the finishing touches on her huge DIY patio, but I’m totally focused indoors right now. Here in the northeast, we’re experiencing cooler weather and are getting ready to send our kids back to school, and all that has me in the “let’s get cozy, wear sweatshirts and bring out the pumpkins” mindset. One of the major focal points for seasonal decor in our house is our fireplace and mantel, which I decided to give a little makeover before bringing out my fall decor. All it takes is chalk paint, a stencil and a lot of patience. 1. Prep your fireplace. 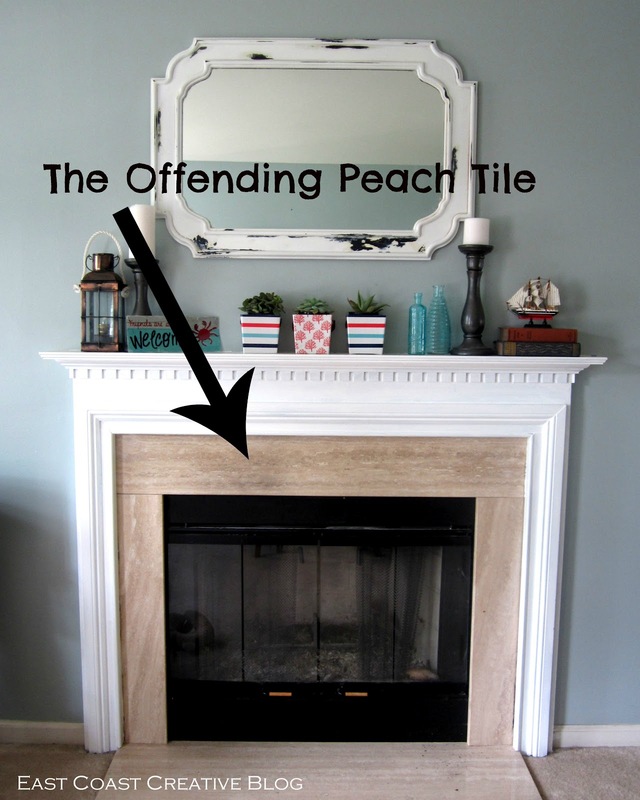 I had a peach marble tile fireplace surround that I hated. Yuk. Anyway, I wiped it down with a damp cloth to remove and dirt, dust and soot. 2. Choose your paint. I used Annie Sloan’s chalk paint in Pure White and French Linen. Man, I am in love with this stuff! It adheres to any surface- even marble!- with no trouble. Just a quick word about fire safety: we don’t use our fireplace, so I wasn’t worried about whether or not it was flammable, but be sure to check your paint if you have an active fireplace. 3. 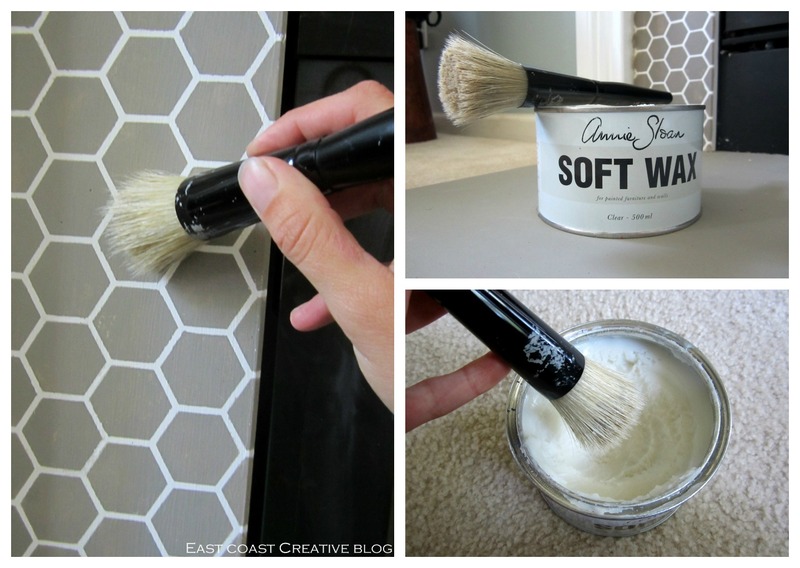 Brush your base coat onto the surround. I used Pure White and it took 2 coats to get even coverage. I recruited my hubs to do this part, since, let’s be honest, painting trim is not my strong suit and I’ll take help when I can get it! 5. Begin stenciling. The trick to stenciling without any bleeding is to off-load your brush properly. After dipping into the paint, dab it onto an absorbent paper towel or cardboard until it there is very little paint on the brush. Both my stencil (Beehive Furniture Stencil) and brush are from Royal Design Studio, and they are excellent quality, which makes the job go much smoother. I had to do two to three coats for every stencil to get the coverage I was looking for. Words can not express the excitement of pulling back that very first stencil. Go ahead- try it and tell me that’s not true. At the end of the first night, here’s what I had accomplished. Ugh. I saved the hard parts for last. Yippee! 6. Cut your stencil to fit the corners and edges. Oh, this part is so hard, because as I was cutting my stencil, I was envisioning all the projects I could do with it go right down the drain. But, it’s absolutely crucial to cut the stencil if you want clean, crisp lines all the way around. 7. Touch up any paint bleeds with a small fine-tipped paint brush….or toothpick, in my case. No matter how good you are at stenciling, there will always be some bleeding. It’s easy to touch it up with the base paint color and a steady hand. No one will be the wiser! 8. Finally, wax it and you’re done! You’ll want to add some kind of protective finish, and I used Annie Sloan soft wax, which was formulated to work with chalk paint. After all that hard work, you’ll want a force field surrounding this thing, but wax will have to do. Step back, grab a drink and enjoy your pretty new fireplace surround! 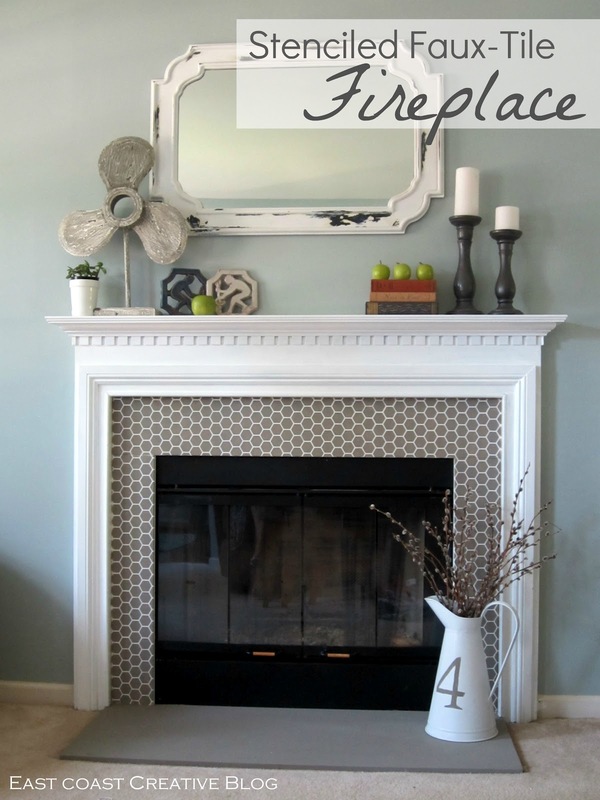 I love love love it, and am already planning a room makeover based on this fireplace!